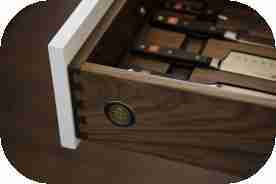 Walnut drawer inserts come with larger Wusthof Classic Knives than the ones available in block sets. "Ultimate Collection" Simply the utltimate set of knives that are available. Wusthof was originally chosen because every time we were researching kitchens in famous estates, these were the knives that we saw. "Culinary Collection"(shown). All of the knives a Top Chef would use including: A 9" Cooks knife; a Santoku (Japanese Cook's Knife); a Pairing knife, a Utility Knife; a 10" Bread Knife; a 9" Carving Knife and a Meat Fork; a Flexible Fillet/Boning knife; a Two-Handled Mezzaluna; Come-Apart Shears; a Waiter's Corkscrew; a Sharpener, and a Garlic Press. 8 Steak Knives are optional. Or the smaller "Essential Collection" which includes: A 10" Bread knife; an 8" Carving knife; either a 7" Santoku or a 9" Chef's knife; a Flexible Fillet knife; a Paring knife; a Waiter's Corkscrew; a Sharpener; and Come-Apart Shears. These maple chop blocks prevent you from mixing flavors that don’t go together by separating cheese, garlic, fresh herbs, meat, poultry, and vegetables. Each board is 10-1/4” wide x 14” deep. They come in a 12” wide x 11-1/2” high x 12-1/2” deep walnut case that has traditional through dovetails (like the hand cut dovetails on most fine furniture over 100 years old). A four unit (shown) and six unit version is available. These Stainless Steel Vegetable Bins have become popular because, unlike wicker baskets, they don't easily rot when a vegetable does. Stainless Steel Vegetable Bins look great in every contemporary and traditional environment, and they are available in every wood species. 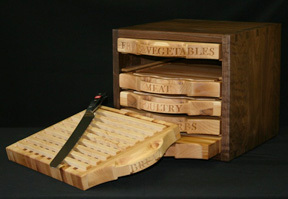 If you store potatoes, onions, etc., this will be a must-have in your new Pennville or Epicure kitchen. The hand painted Pennville Medallion, pressed into all of our top drawers, is symbolic of a time when cabinetmakers engraved their name into their handcrafted masterpiece. This particular medallion is shown on a beautiful walnut drawer with an engraved Wusthof knife insert. Unlike most medallions you'll see, these are made in America - just a few blocks from the Pennville campus. These corners drawer units are a good use of often wasted space. If you are looking for more storage in drawers, this may be an excellent item for your Pennville kitchen. Pennville Cabinetry Systems are not confined to the Kitchen & Bathroom. Here you can see a beautiful system of cabinets transforming a room to a state of the art Theater System. See more on YouTube http://www.youtube.com/watch?v=-ahljw_kn7c. Some of Pennville's most impressive work is in our radiused work. We can do any door style in any radius in any color. As always, if you can dream it, Pennville can build it. One of Pennville's innovations that everybody seem to love is our Lazy Susan Spice rack. Although the front of this unit has shallow depth shelves for spices, there is plenty of room to store small appliances, bowls, baking supplies and other items on the lazy susan portion of this unit. The new Servo-Drives are not only a great way to eliminate hardware, but they are truly functional for any drawer that you would regularly touch with your hands either wet or full. Most of all, they're just really cool!